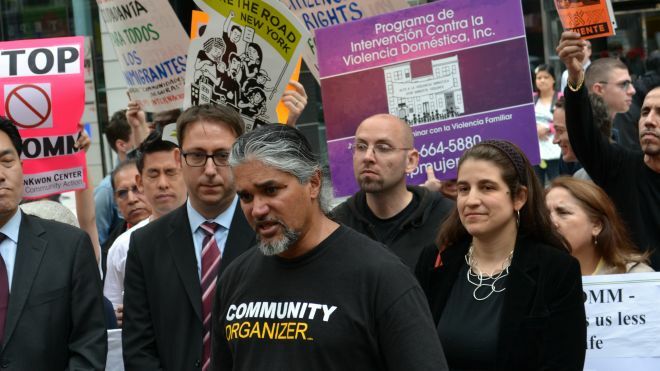 Opponents of a mandatory federal immigration program called “Secure Communities” began rallying in cities that were the last holdouts in implementing the controversial program. The protesters included immigrants, civil rights activists and elected officials. Secure Communities is a controversial program that requires local police to share fingerprints with immigration officials. The federal government has been implementing it in phases, planning eventually to have it in place nationwide. U.S. Immigration and Customs Enforcement, or ICE, sees the program as a tool for finding and deporting undocumented criminals. Opponents say it can easily lead to profiling and that it actually makes communities less secure by damaging relations between immigrants and police. Concerns led New York Gov. Andrew Cuomo to suspend the program in June after about half the state’s counties had adopted it. But a law enforcement official familiar with the program said Monday it will launch statewide Tuesday. The official spoke on condition of anonymity because they weren’t authorized to discuss the program. Over the weekend, William C. Thompson, Jr., a former New York City comptroller who plans to run for mayor in 2013, fired off a letter to President Obama assailing the implementation of Secure Communities in New York. Last week in Boston, immigrant rights activists and representatives from faith, labor and human rights organizations condemned the implementation of the federal immigration program in Massachusetts. Meanwhile, in the state of Washington, immigrant rights groups are lobbying King County officials to stop holding suspected undocumented immigrants in county jails to challenge Secure Communities. The program was fully activated in Washington state last month. The program has been almost fully activated nationwide, despite protests from some state governors. This story contains material by the Associated Press.